If you’ve ever hiked—or wanted to hike—the John Muir Trail (JMT), the iconic High Sierra route from Yosemite Valley to Mount Whitney, you may know how limited—and coveted—those hiking permits are. Well, in 2020, with the implementation of a new permit and quota system in Oregon’s Three Sisters, Mount Washington and Mount Jefferson wilderness areas, section-hiking the Pacific Crest Trail through this region may become just as exclusive. For the past couple years, the Willamette and Deschutes National Forests have been working on a new permit and quota system across the Three Sisters, Mount Washington and Mount Jefferson wilderness areas in order to address concerns about increasing use and its effects on these wild areas. Earlier this year, officials from these forest districts held a series of public information sessions to share several draft proposals of possible courses of action. The five options ranged from option 1): do nothing (as required by law), to option 5): maximum clampdown on all outdoor use. With the new Draft Decision released last week, it appears they have chosen option 4): significant limits on most trailheads within the designated areas. If there’s a silver lining, it’s that they have removed the Diamond Peak and Waldo Lake areas from the Decision, both of which were originally included in the change plan. Within the Draft Decision, the Forest Service has indicated which trailheads will be affected by the new system, and the number of daily permits that will be granted for access. There will be limits on both dayhikers and overnight backpackers, as well as new fees imposed on all. If you’re familiar with the restrictions associated with the Obsidian or Pamelia Lake Limited Entry Areas (LEA), this plan essentially turns this entire cluster of wilderness areas (and nearly 100 miles of the PCT) into one huge LEA. Sadly—and questionably—these limitations will exceed those of some of the most popular national parks, and restrict access to a huge portion of some of Oregon’s most scenic public lands. Thru-hikers holding a PCT Long-Distance Permit (hiking 500+ miles) will be given pass-thru permission to cross all three wilderness areas. This is in accordance with the current long-distance permit allowance. Long-distance hikers should still fill out the self-issue wilderness permits at the entry kiosks at every wilderness area they enter to assist with usage data collection. New No-Camping Zones will be implemented in some popular and high-impact areas. This will include the Obsidian area and North/South Matthieu Lakes in the Three Sisters Wilderness, and Coyote/Shale Lakes and Jefferson Park in the Mount Jefferson Wilderness. The Forest Service will be releasing boundary maps for these no-camping zones once the plan is final. Camping in the Obsidian and Coyote/Shale Lakes will still be permitted with a separate, valid LEA Permit for the respective area. The PCT Corridor through these wilderness areas will be extended to 1/2 mile on either side of the PCT to allow for more camping flexibility. New camping setbacks of 250 feet will be implemented for Obsidian Falls, Minnie Scott Spring and Pamelia Lake. The Forest Service will be implementing the new Skyline Permit for hikers interested in section-hiking across multiple designated wilderness areas in this region. This permit is intended for those hiking less than 500 miles and don’t qualify for a Long-Distance Permit. 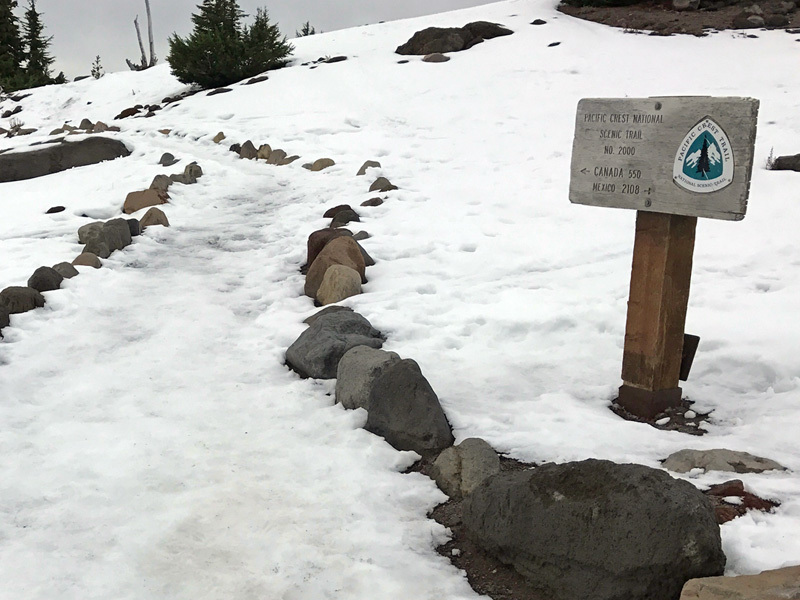 It will be required for anyone starting their hike in a designated wilderness area (Three Sisters, Mount Washington, Mount Jefferson), as well as anyone hiking larger portions of the PCT through Oregon and requiring pass-thru privileges. Skyline Permits will be limited to two starts/entries per day, and will be restricted to specific entry and exit dates. Skyline Permit holders will not be permitted to start their hikes from any of the trailheads on the Cascade Lakes Hwy out of Bend, e.g., Elk Lake, Devils Lake, Sisters Mirror Lake, etc. Also off-limits are any of the lateral trails within any of the designated wilderness areas, e.g., Hinton Meadow, Scott Pass, Pamelia Lake, etc. Use of these trailheads for a PCT section-hike would require both a Skyline Permit and the respective trailhead permit. 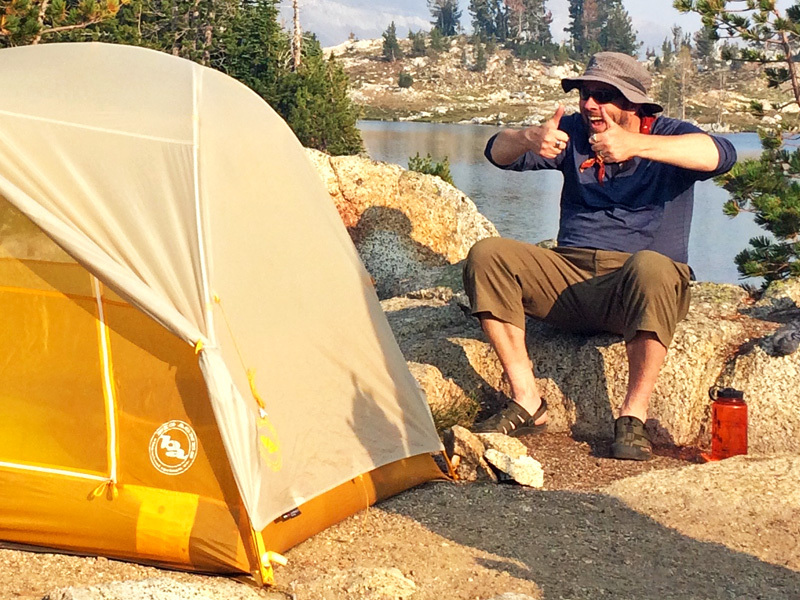 Skyline Permit holders will not be required to observe the same no-camping zone restrictions as Long-Distance Permit holders, yet will be limited to the same PCT Corridor requirement of camping within 1/2 mile of the PCT. It will also include the same 250-foot setbacks at Obsidian Falls, Minnie Scott Spring and Pamelia Lake. Camping side-trips to locations such as the Snow or Mink Lakes, Hinton Meadows, Eileen Lake, etc. 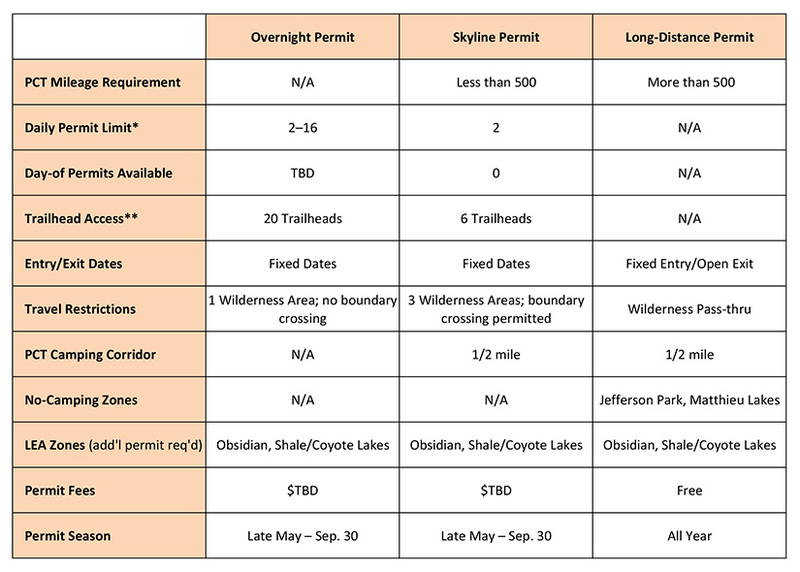 will not be permitted unless you also obtain a valid permit for those respective trailheads; camping in the Obsidian and Coyote/Shale Lakes areas will still require a separate, valid LEA Permit. Skyline Permits will go into effect beginning with the 2020 hiking season, and will be only be available through the recreation.gov website. They will be required from the first Friday before Memorial Day through Sept. 30, and there will be a yet-to-be-determined per-person fee. It is still unknown if Skyline Permits will be available on a day-of or walk-up basis, and there is currently no plan to deal with cancellations or no-shows. Hikers planning to do an overnight backpack that may incorporate portions of the PCT, but remain within a single designated wilderness area, will not be required to obtain a Skyline Permit. They will be required to obtain a permit for the desired starting trailhead, and adhere to the new daily limits imposed on each (see trailhead chart). These permits will not have camping restrictions (except for the LEA areas), but will be limited to specific entry and exit dates. *The Daily Permit Limit indicated in this chart shows the number of “group” permits that will be made available. A “group” may consist of a single hiker up to a maximum of 12 hikers. Overnight permit quantities are based on individual trailheads. **For more information on Trailhead Access, see the Trailhead Chart below. If you’re thru-hiking the PCT, or hiking a larger portion of the PCT (500+ miles with a Long-Distance Permit) the changes are marginal. The No-Camping Zones in the Jefferson Park and Matthieu Lakes areas will be frustrating—especially considering that large swaths of forest surrounding these areas have recently burned—but there are still some good campsites near the trail in these areas that will allow you to enjoy these locations. You may even discover some of the “hidden gem” campsites in these areas. For those interested in section-hiking some or all of the PCT through Oregon (less than 500 miles with a Skyline Permit) that includes crossing these wilderness areas, things are going to get challenging. First, you will have to be lucky enough to score one of the two daily Skyline Permits. Those wishing to start their hike in this area will have to stick to specific start and end dates with no flexibility. If the weather is bad, the snow is too deep, or you have any personal changes, you either use it or lose it. Also, the limited starting trailheads means you may have to make your trip longer or shorter than you would like, or it may require you to drive rough roads to access a more remote, albeit designated, trailhead. For section-hikers on longer trips (e.g., full Oregon PCT) who require passing through these areas, you have little flexibility to change your hiking itinerary and will have to target your passage through these designated wilderness areas to the specific dates you choose. No extra zeros or neros if you get tired, sore or find a nice spot you’d like to stay and enjoy an extra day. 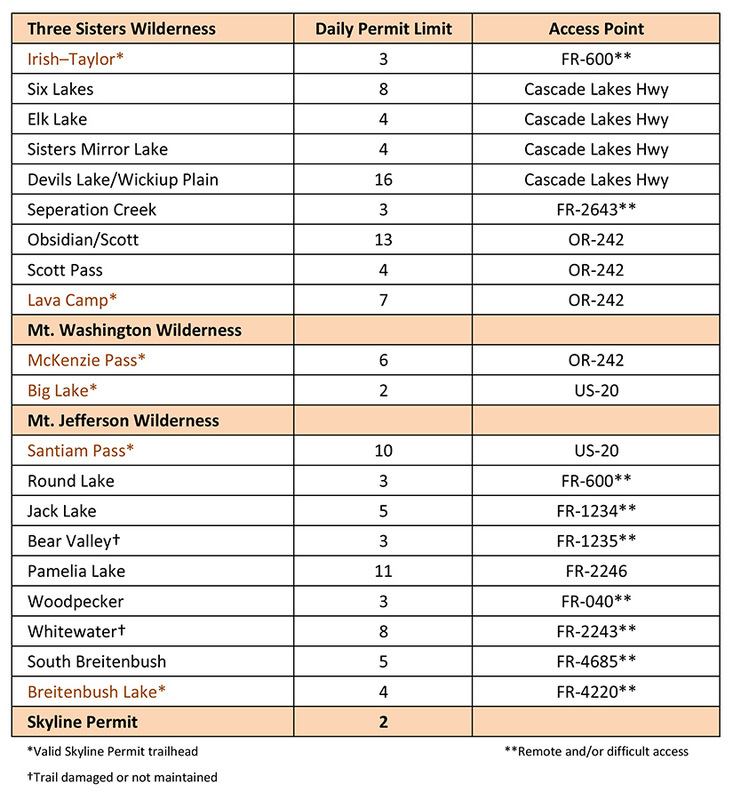 Overnight backpackers and shorter-distance hikers who may incorporate some of the PCT and will be remaining in a single wilderness area will just have to compete with fellow hikers to obtain what few permits will be available for any trailheads that will soon have daily limits applied (see trailhead chart). Similar to the Skyline Permits, these will be specific to start and end dates with no flexibility, and may require you to settle for a less-desirable trailhead. The Forest Service has indicated that there will be limited day-of permits available for spontaneous trips, but they don’t yet know how many of these permits will be available for each trailhead, or what the process will be to obtain these. While we agree that action is needed to address some of the crowding and negative impacts inflicted upon these wilderness areas due to increased usage, we feel that this Draft Decision is short-sighted in its scope and fails to seek reasonable solutions in reducing impact while maintaining access to public lands. Their own data indicates that the majority of impact results from day-users at mostly frontcountry destinations, yet the limits of the Decision are unfavorably targeted at backcountry users. We fail to see how limiting PCT section-hiking entries minimizes impact in the Green Lakes area (nowhere near the PCT), which, under the new plan, will still allow nearly 100 hikers and backpackers per day. According to Peterson, the limits to section-hikers are not based on definitive PCT or section-hiking data, of which there is little, but presumptions based on usage metrics mostly coming from day-use and general overnight data. He suggested that the Adaptive Management Plan as outlined in the Decision will allow them to make adjustments as necessary, but we feel these limits are too aggressive at the start and based on too little information. The Decision also ignores or dismisses potential solutions including, but not limited to, limited permit requirements (e.g., weekends, holidays), designated camp areas to mitigate impact, wilderness privy installations to reduce waste, and improved trailhead access and parking. In our experience on the PCT in Oregon over the last five seasons (2014–2018), we have observed the impacts of increased traffic in these wilderness areas. Yet, in our opinion, that impact has remained mostly negligible, as the majority of PCT hikers we’ve witnessed and interviewed are diligent in maintaining clean backcountry camps and adhering to Leave No Trace principles. 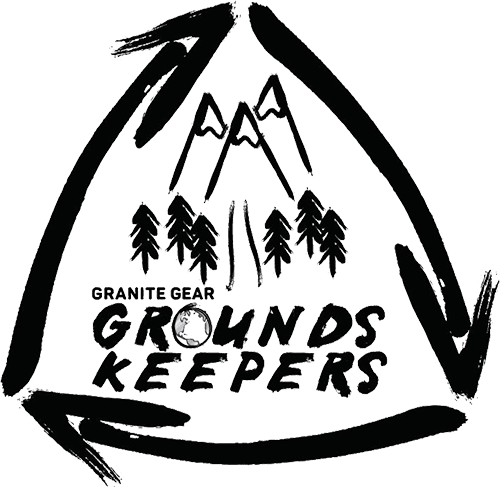 In 2018, as a member of the Granite Gear Grounds Keepers, we collected less than 6 pounds of trail trash over a distance of more than 200 miles—and the majority of this was collected at frontcountry campsites, not in deep wilderness areas. And as far as “crowding” goes, during each of these seasons we have been able to spend several nights in some of these wilderness areas with no other hikers or campers around, and have still been able to enjoy plenty of solitude and privacy. And then there’s the socio-economic impacts of new fees and potentially restricting lower-income communities access to public lands. Under the new system, a per-person fee will be charged for both day and overnight users. There will also be a fee for making a permit reservation, which will likely be necessary due to the limited availability of day-of and walk-up permit availability. And that’s on top of the NW Forest Pass that will still be required for parking at most trailheads. That’s three fees that will now be required for accessing public lands in this region. These fees are yet to be determined, and the language about how these fees will be used is vague, but this has the potential of making visiting these wilderness areas more expensive than visiting Yosemite or Mount Rainier—and those locations don’t put limits on dayhikers, and the fees collected support park infrastructure and accessibility. And then there’s the question of how these new limits will affect a region that relies heavily on outdoor recreation and tourism, which is another ball of wax we won’t get into here. We will be strenuously objecting to the proposed Draft Decision until the Forest Service can take a more reasoned approach to backcountry use and PCT access based on actual data, and consider more thoughtful and proactive actions to addressing both the need to preserve wilderness characteristics and ensure that our public lands—and the PCT—remain reasonably accessible. Our concerns on this issue are shared by Scott Wilkinson and Dana Hendricks of the Pacific Crest Trail Association (PCTA), and we’re pleased that they agree that the current Decision is quite unreasonable in its treatment of PCT section-hikers. The PCTA will be considering their own response to this Decision. How will these new restrictions affect your ability and interest in hiking the PCT and our public lands in central Oregon’s wilderness areas? Leave your comments below and we’ll share them with the Forest Service in our formal response. Read the full Draft Decision. See the full Environmental Assessment. I believe I agree with your perceptions of the access limits. How can I help? I’ve lived in oregon my 58 years and one of the things I’ve loved about our wilderness is the access (on a whim) I’ve had to it. Wilderness doesn’t seem like wilderness if I have to get a permit to go there. It feels more tame with it becoming a ‘pay for activity’. 1) Just because there are many people in a given area doesn’t mean they need to be close enough to each other to diminish the wilderness experience. More trails, strategically cut would disperse the folks away from each other. 2) Climate change has moved California’s climate into Oregon. Our trees are burning down and they aren’t going to repopulate like they have in the past. Global Warming is a human infusion into our wilderness areas. These changes (larger and more frequent forest fires) that we are witnessing will only get worse. (Now relating back to my first point…) It is my belief that action needs to take place to mitigate the future loss of our forests. I believe that, in addition to more trails noted in point 1 above, we may need to denude a number of ridges and other strategic locations to act as fire breaks. New trails could take advantage of these ridges with, hopefully, some nice camp spots with amazing views from these ridges. Incorporated into a new set of trails could be an app that hikers could have on their phones, with designated ‘cell service’ locations on the trails where hikers could use the app to notify authorities, via the app, of smoke or direct knowledge of fires or smoldering fires. (The Whitewater Fire last summer smoldered for days before it erupted to burn all the trees off Mt. Jefferson’s west flank). This would give authorities ‘eyes on the ground’ in helping to identify locations needing attention. The app could be fairly simple to use: stop at a cell location, point your phone lens in the direction of the issue, tap on a button, and the app could send the hiker’s GPS coordinates and direction that the lens is facing to a computer which would cross reference other hiker’s submissions and likely triangulate onto the fire issue’s coordinates. By designing the trails to allow line of sight to the bulk of our forests, and with additional hikers out there, it’s likely we could act on fire potentials before they erupt into larger unmanageable forest fires. (I’m not going to get on my soapbox here about the disproportion of fire fighting resources used for fighting the fires next to private lands (timber lands) vs. the resources used to save our wilderness / recreation forests!…). I agree that we don’t want ‘man’ altering our ‘wilderness’ areas but I feel that taking no action is simply going to allow the denuding of Oregon to occur unchecked. This global warming is not a natural event yet it is destroying our forests. 3) No campfires above 5700′ – I don’t like that. While a campfire may not be necessary on those 100 degree Portland days, there are many more nights at many of our high elevation (and lower – which I suspect is being considered) camp locations where a campfire makes the experience pleasurable rather than survival. Not all of us enjoy privation. Perhaps we need an education alternative whereby folks can learn to make safe campfires with little impact and they need to cary their ‘certificate of campfire education’ (like my industry’s continuing education requirements) with them when they build a campfire at these, to be, disapproved locations. Of course if collecting wood in an area that would quickly be ‘overgrazed’ (a word we remember from the sheep era) the above education would teach folks that those locations are not appropriate for campfires. While campfire rings are direct evidence that we aren’t the first people to trod an area, they are a part of the camping experience and many folks generally have accepted their existence. I’ve noticed that the forest services’ attempt to disperse some of these dead campfire coals have simply moved them into a convenient nearby location creating two or more spots, now, with dead campfire coals. 4) On a more ‘in keeping with the current topic’ – I feel their proposal is way too strict. Though, the reality is that ‘I’ personally will benefit from them because I’ll simply get my permits early and prevent other folks from getting a chance to enjoy the areas I love. That said, that’s a problem because it prevents more casual users from getting access to these places. As much as I hate the crowds, I personally feel that all folks should have the opportunity to enjoy these amazing places. 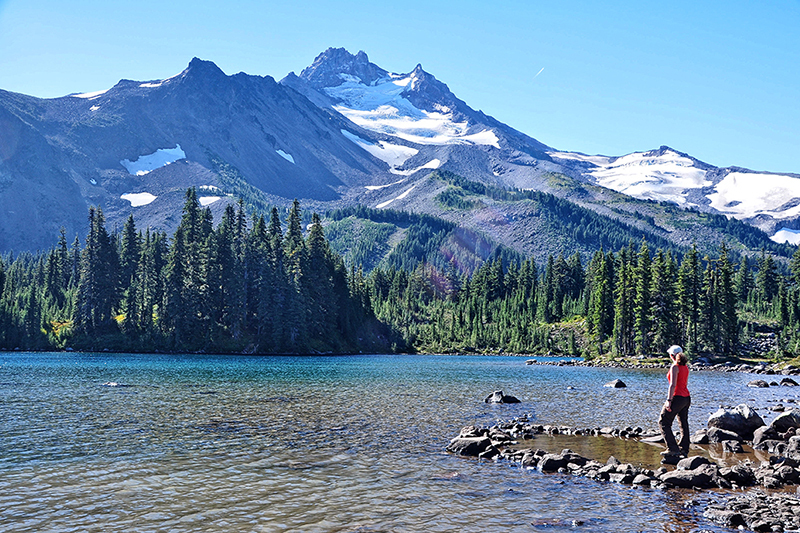 That’s what Gifford Pinchot set up for us – places where the common folks can go to recreate for free. I have many more thoughts on all of this. I would appreciate the opportunity to meet with you in person (maybe over lunch or at your facilities) to discuss this current situation and the situations yet to occur. Hi Chris – Thanks for your thoughtful comment on this issue. For now, this is the best you can do. We’ll be collecting hikers’ comments and sharing them with the Forest Service to show how these new plans will impact our ability to access Public Lands and hike the PCT. We’ll keep you posted when there’s new opportunities to get involved. Cheers! So basically now they’re telling us we have to register our feet and our asses to go on a trail just like you have to register your car to drive on the street! You know what come arrest me, handcuffed me and walk me out of the trail! So here’s what I know from a little bit of my own history and experience and that’s all this is his my own experience. 20 years ago or so I was married to a woman named Terri. Her first husband sister was named Connie. Connie was getting her master’s degree in lodgepole pine. So I asked her one day how that would benefit her to have a master’s degree in a single species of tree. and just so you know upfront she didn’t like me very much anyways. So she pointed her finger in my face and told me she was getting her master’s degree because she intended to go to work for the United States Forest Service because she didn’t believe the people like myself belonged in or should be allowed in the forest at all and she would be working from within the organization to make that happen. I asked her who she did believe had the right to be in the national forest and she told me that only people who were members of Greenpeace or Sierra Club or a similar organization had the right to be in the forest and all others must be kept out! The last I heard of her since I have now been divorced from Terri since 2005 Connie had gone to work for the forest service but I couldn’t tell you where she was working at other than she was from Grass Valley and maybe her and others are finding success in this ideology! Then as a construction estimator I was bidding projects that were called road decommissioning projects. These projects required us to go in and basically make existing Forest Service Roads disappear. my friends here in Lassen County that work for the forest service also tell me they spend much of their work season doing the same thing. Lassen had a public meeting one day years ago where this subject came up and one of the top guys who I personally know what the forest service stood up and lied to everyone in the room and said that there were no such projects being done by the forest service either by their own crews or by public contract. I know for a fact this is a flat out lie and that at least the Lassen is making roads and access to the forest disappear as fast as they possibly can. So to have restrictions like this being put on a public access trail doesn’t surprise me in the least! I disagree with it 100% And I will not comply! Those are federal lands that belong to every taxpayer and every taxpayer has the right to use them and the duty to use them responsibly! If you’re not using them responsibly and being destructive then you should be held accountable for that but you should not be restricted especially individuals like a good friend and I that are finding it more difficult through age and or injuries to access the forest! 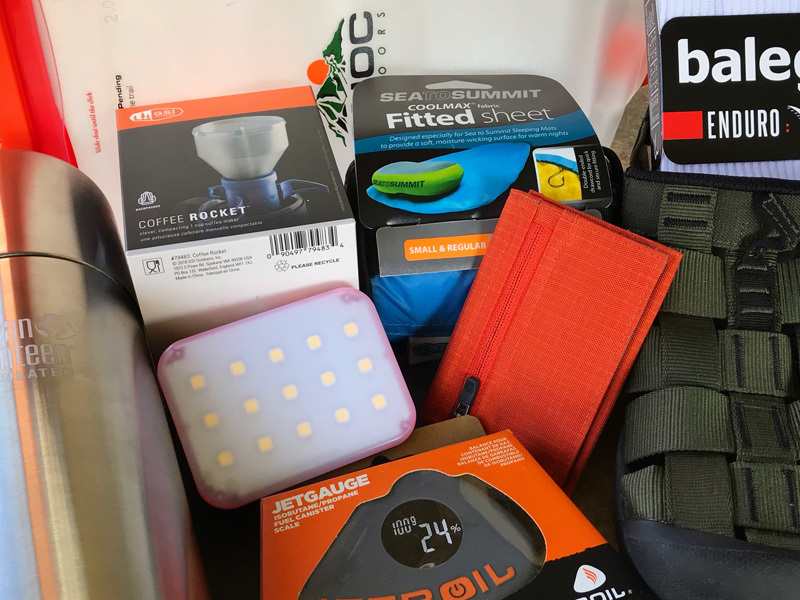 The new restrictions will greatly affect my usage of trails – day hiking with my 8 year old daughter, taking her backpacking, and then section hiking Oregon on the PCT when she gets older. For now, the trail restrictions are so extreme so fast. Here’s my scoop — I work part time as a personal trainer in Bend, OR and when I am not working in the summer, I am on the trails (with or without my daughter). Beyond South Sister and Green Lakes, I spent NUMEROUS hikes in solitude this summer & fall (June through October) in the Three Sisters Wilderness – in most of the areas there will be restrictions put on. How can you limit people in an area where it is not over crowded? I too would have picked up trash if I had seen it — I rarely picked up anything and never saw toilet paper on the ground. In fact, most of the time I count the number of people I pass – rarely did I count double digits (even at Devils Lake). Then, there is no way that I can get a permit, each time I want to hike — my schedule changes daily. 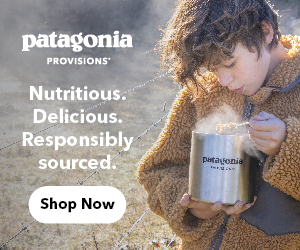 HOW CAN YOU DENY AN 8 YEAR OLD AN OPPORTUNITY TO HIKE , away from screens, in nature, doing what our kids should be doing, but rarely do these days? Then, there is backpacking. What do I do if I pick a date to take my daughter backpacking and it is cold and rainy? In the past, we could try and go the next weekend, when she’d have a better time and not be miserable. That could not happen with the new changes. Then, there is hiking the PCT through Oregon in a few years. What a pain in the tush the new restrictions are! How am I even supposed to explain that to a kid and have it make sense? When you get even farther away from the trail heads, the people are less. PCT thru hikers don’t have as many restrictions, but you are going to limit me because I cannot take the entire summer off to hike the entire PCT? So, I will be penalized for trying to section hike it now. 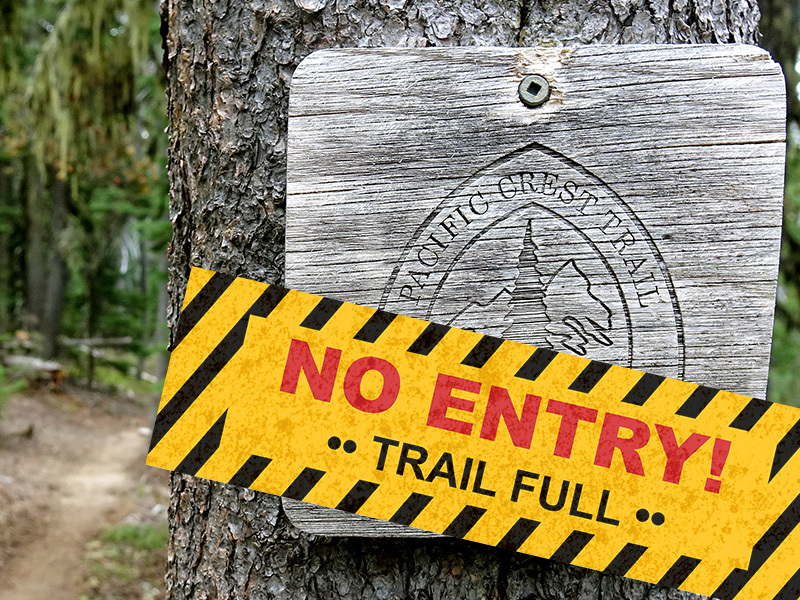 That’s not good — that is going to limit so many people from getting out and doing what the PCT was designed to do! Then, there is the cost — my NW Forest Pass, fees to do the hike/overnight, plus fees to make all of the reservations. Yikes! Hi Julia – Thanks for your comment on how this new plan will affect yours and your daughters ability to access Public Lands and hike the PCT. We’ll share this with the Forest Service and keep you posted when there’s new opportunities to get involved. Cheers! These proposed new rules continue to reflect the bias in favor of thru hikers and against section hikers. I am sick and tired of thru hikers being treated like royalty and section hikers getting the shaft. I blame this on the PCTA. Their focus on thru hikers is so over the top and biased that it has now spilled over to the Forest Service. So a thru hiker can get a permit to hike 2,650 miles for free and I as a section hiker have to pay for a permit to hike 100 miles, and that assumes I can even get the permit. That is just not fair or appropriate. I hiked about 300 miles of the Oregon PCT this last August and it was overrun with thru hikers. Many of them are from outside the United States, people who have never paid a nickle of US income taxes that help pay for the trail. Why not limit how many thru hikers can enter these areas in any single day? Why are thru hikers treated as a special class? It has been my experience that section hikers are much more likely to help maintain the trail than are thru hikers. On the trail crew that I belong to in Southern California there is not a single person who has thru hiked the PCT. Maybe we should restrict the access to persons who have done a certain number of hours of trail maintenance work. You’re welcome! Happy to help and will hope for a different decision to be made! These new regulations regarding use of Oregon public lands appear to favor thru-hikers (most of whom are non-Oregon-residents) and place restrictions on section-hikers (most of whom are Oregon residents). In my experience on the trail over the last 5 years, the number of thru-hikers vastly outnumber the section-hikers. If we are wanting to preserve the condition of the trail and its surrounds, it seems to me that the first restrictions should placed upon the most frequent users: thru-hikers. If restrictions to Oregon public lands are necessary, they should be placed on non-residents before Oregon residents. 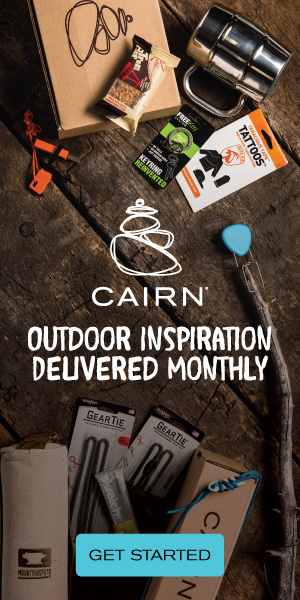 So the next best thing for anyone that wants to section hike or weekend or backpacking trips…. 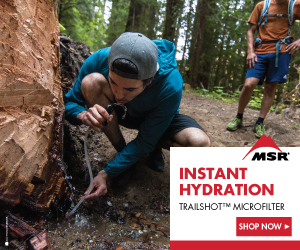 just do what the several thousands of other hikers do and apply for a thru hike! You wont have to pay no fees and no big restrictions, (insert Sarcasm), many hikers flop anyway. This is Ridiculous to restrict the locals to pay and oh by the way, not today we already issued our permits. Seriously, why do the thru hikers get a free permit? They aren’t paying for the NF annual pass, the locals are and now you all want to add more FEES to the locals?! Thru hikers can take all zeros days they wish, and if they dont finish by their said date, no worries, just keep hiking right?! Thru-hikers are killing it for the locals! Thanks PCTA! Maybe in 2021 the number of apps for thru hiking will multiply by 100. And what Julia said… HOW CAN YOU DENY AN 8 YEAR OLD AN OPPORTUNITY TO HIKE?!?! Jim Banks… You Nailed it! These types of restrictions are unnecessary. The majority of day use and section hikers are conscientious. They leave little to no trace and respect the area. Individuals who wish to head into the wilderness for a relaxing weekend and unwind after a harsh work week will now have stress about where to go because access to their public land has been limited or denied. In addition to closing the gate to the American people that own this land, these restrictions and fees disenfranchise low~income families. The families that live in the area who can’t afford to drive farther away to be in in such beautiful places. And those that work time~off limited jobs, if they are unable to obtain a permit for the vacation days they may have~then they are out of luck. At what point did these lands become “the kings” land and us, little more then peasants, trespassing without permits? I am in favor of limiting some areas that are getting overused, Green Lakes being one example. The current draft is very confusing. Simplifying it would help. And let’s not hinder the opportunity for hikers to be spontaneous or to change plans due to weather. The Deschutes and Willamette NFs really should look into how the Tahoe National Forest handles permitting for the Desolation Wilderness (supposedly the most visited wilderness in the country). The permitting system is very lenient when it comes to people hiking through the wilderness on long distance trails (i.e., hikers who are “passing through” the wilderness rather than staying in the wilderness for their entire trip). When I applied for my permit when I hiked the Tahoe Rim Trail, they asked for a window of dates during which I would be in the wilderness – not specific dates – because they recognize that on a long hike you don’t necessarily know exactly when you will be entering and exiting the wilderness. They gave me a permit for one week, which easily accommodated any change of plans that could come up. On the other hand, for hikers who plan to stay in the wilderness, they are much more strict about entry and exit dates as well as campsite locations. I too am concerned about these new regulations. I have lived in Oregon for over 50 years. At the age of 64 as part of my therapy recovering from a serious health issue, I set a goal to hike the entire length of the PCT in Oregon by the time I reach 70. I’m not fast, nor do I do more than 10 miles a day. But for the last three years I’ve managed to hike three small sections each summer, usually three or four days a section. With the proposed changes, reaching my goal of completing all of Oregon is going to be near impossible. What would be very helpful is if someone would create a map of exactly what areas are going to be effected. Maybe even providing mileage markers or shaded areas. If I knew this, then perhaps this year I can focus on doing my hikes in the areas I might not be able to do in following years. It is sad that thru hikers, although I envy them, are pretty much exempt from these changes. Hi Terry! Thanks for your comment. We certainly share your concerns, as not all PCT hikers are thru-hikers. The Forest Service maps in their docs are rather confusing. We’ll work up a PCT-specific map per your suggestion and get that posted soon. Cheers! Hi Terry – I agree with you. I’m 58 and have lived my entire life in Oregon. I’m not very keen that the federal government is now telling me I can no longer simply follow my personal impulse to go camping (say, like tonight) in those areas I’ve had available to me all my life. I feel like a part of my Oregon freedom has been taken away. That said, I also plan to hike the Oregon PCT (hopefully in one walk); I’ve heard some of the thru-hikers note that all we have to do is get a PCT thru-hikers permit and then we’ll have the same access they have. This seems to me a solution in search of a problem. I am opposed to this change. My wife and I have section hiked about 800 miles of the PCT over 5 years averaging about 2 weeks of hiking per year. Due to her job in a school district in Vermont, we can only hike between end of June and end of July. 1. When hiking in Oregon, I estimate that we would only cross paths with about 8 thru or section hikers per day. If you double that number to account for people backpacking in the same direction (who we might not cross paths with), that’s only 16 people which isn’t enough to severely impact an area. I almost never felt like my experience was negatively impacted by too many people.That’s 16 people per day spread out over the 15 miles that we hike on average per day, meaning about one person per mile. That’s not much. 2. The only places (maybe twice in 5 years) where there were so many people that our camping experience was negatively impacted are always at lakes within 5 miles of major trailhead on a weekend. The vast majority of people here are never thru hikers or section hikers; they’re typically people who live in Oregon who are camping for the weekend, and try to find a scenic location within a few miles of the trailhead. 99% of the people staying at these locations aren’t section hikers or thru hikers. 3. We went through the permit process to camp at Pamelia Lakes, and were lucky to snag the last two permits available for July 2. We were the only people who actually were at the location on July 2, suggesting the most people buy permits months in advance, and were unable to attend for a variety of reasons. 4. With work and family commitments, we’re not able to book our vacations months in advance. I’m lucky to get 2 weeks notice. This permit system would deprive me of the ability to visit these places. Hi Eli. I met you at Salem when the USFS made their required pitch to us. I told you it’s a waste of time and they are going to do whatever they want. First of all, just 2 per day per trailhead for a skyline permit ? What’s up with that ? 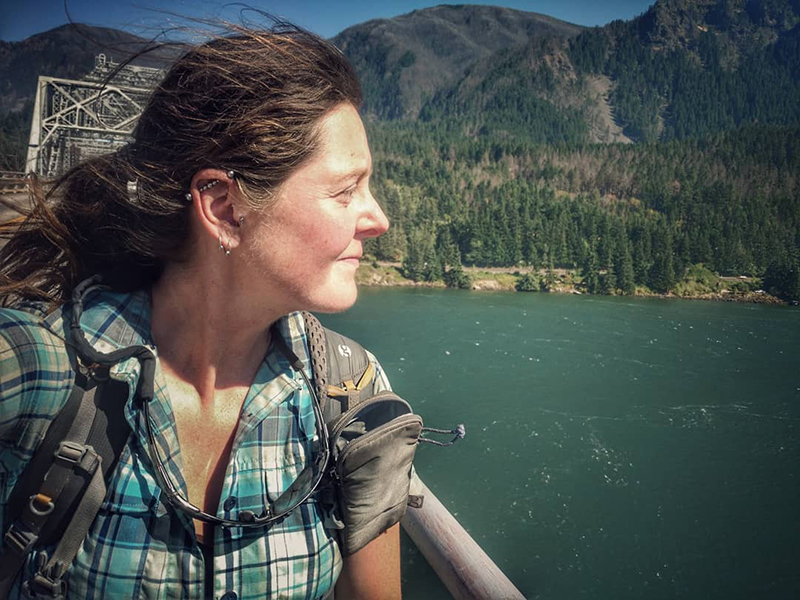 And suppose you want to hike Cascade Locks to Ashland. How do you permit that ? The number of permits for all the trailheads are way too low. Second, I don’t like this permit process any more than anyone else does. But these are National Forests and not State Forests and I’m reading a lot of sour grapes in these comments about how locals should have priority over others. Should Californians have priority over others for the JMT ? As far as getting a thru hike permit to bypass the process, the PCTA is only allowed 1400 section hike permits that overlap the JMT . I guess the Feds are on to that scam and I’m sure they will be doing the same in Oregon. These restrictions only cover certain trails and there are many more to choose from. Third, the permit window is too long. 6/21 – 9/7 would be sufficient. This last September, mid week, I hiked many trails and camped at places like Jefferson Park, Mink Lakes, Mt. Washington, Carl Lake, Wasco Lake to name a few and had these locations all to myself. I was the only person there. Thanks for your effort. Thank you for this discussion. Like many others who commented above, I supported the idea of some restrictions and assumed the highest use trails (like Green Lakes and South Sister) would be targeted. Restrictions here on high use weekends has become critical! But the approach they are using makes no sense – it’s complicated, unfair to local spontaneous families, and doesn’t solve the real problem. Thank you for passing this on to decision makers. Count me in with the skeptics. I finished Oregon this summer, after three years, multiple fire closures, and ill health. Like Terry above, I’m a slow but steady hiker, dedicated to completing Oregon. I’ve had to flip around the state, making decisions on the fly, to keep myself from burning to a crisp. But I was bound and determined to meet my goal, even if only a hundred or so miles at a time before my body was done for the year. It seems that folks like me will be completely shut out from enjoying the Oregon PCT. Section hikers have to plan meticulously to get on the trail…time off work, airline tickets, family responsibilities, you name it. For a sectioner to gamble that he/she would get one of only two permits is ridiculous. None of the other permitting bodies I know of have such stringent requirements, and I live in Washington, home of the Wonderland Trail and the Enchantments. I know that there is a real concern that the trail will be overrun with trash and other LNT violations. I’ve hiked 1000 miles of the PCT, and the sectioners and thrus are just not the ones causing damage. We spend weeks and months on our beloved trail, and it would be foolish of us to destroy it. Thanks, Eli, for your advocacy. Dont worry! There are plenty of other places to hike. 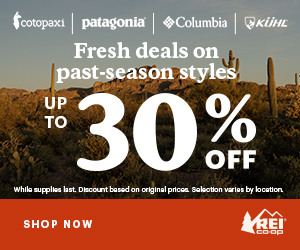 I think we appreciate that, but for most of us here the goal is to section hike Oregon on the PCT. These restrictions on the Oregon PCT are ridiculously punitive. As a local Oregonian I have been hiking in the Cascades for well over 35 years and I am aghast at these kinds of federal regulations in our beautiful state, on our trails. I section hiked a large portion of Oregon 2 years ago and ran into more thru-hikers then any other kind, along the Pacific Crest Trail . Why are section hikers bearing the brunt of this kind of Regulation? If anyone from the Forest Service is reading my comment, I implore you to rethink a fair and more equitable solution to overcrowding and the impact that you seem to think is happening. Allowing a total of 8 section hikers a day onto the PCT, at 4 remote and difficult to get to locations outlined in this article, seems to be unfair, unreasonable, unjust and is inviting average citizens who love the wilderness to break the law. Complying with the restrictions may very well be detrimental to hikers safety if you consider weather hazards and other scenarios. Please reconsider! I feel that the current proposal unfairly restricts back country usage. Thru hikers and section hikers have minimal impact as they are carrying their loads. It’s day hikers and weekenders at front country trailheads that have more potential to negatively impact the environment. I hope that this proposal will be reviewed and reworked to keep in the spirit of loving this land. As I do! Just reading these rules makes my head spin. If the goal is to have fewer hikers, they’ll win because many of us find constraining permits too challenging. It certainly eliminates spontaneity and reduces the fun factor for section hikers. Being a section hiker has so many logistical challenges already without adding more rules and permit requirements. I hiked the section from Crater Lake north to Obsidian late July early August 2018. I saw maybe a dozen people the entire hike. I would like to see the PCT corridor with open access for those with a PCT permit, whether that be section or long-distance. We can live with the camping restrictions, but we need side trails available for entry and exit without penalty. Thank you Eli for being our voice and bringing these issues to the forefront. I’ve lived in Alaska the last 25 years but have spent the last three summers hiking Distance trails in the lower 48, last July I hiked the Oregon PCT. I meet many great hikers and hiked on many miles of beautiful trail and never felt overwhelmed by the number of hikers on trail. The new proposed permitting system is very restrictive, and seams very out of touch with what other trail and wilderness areas existing permitting system. I can only hope this proposal will be reconsidered. As one person said: “Just reading these rules makes my head spin”. I think that is a fair description of this over regulation. Our public lands are for all to enjoy and all these restrictions are limiting many from seeing and enjoying this beauty, especially those less fortunate. I would agree something needs to be done but this is not the answer, nor are more fees. We need educate the hikers on back country etiquette and I don’t see section or through hikers as the offenders. Possibly online classes before receiving permits and charging for for those classes. This would help cut down on SAR resources being wasted for inexperienced unprepared hikers. After reviewing the supporting documentation from the Forest Service, I don’t see much supporting data. While I understand quotas are probably needed given the recent spike in vistorship, and the resulting new requirements to camp 250 feet from a lake or stream and campfire regulations above 5,700, I’m not too sure about this rather sloppy effort at the Skyline Permit. Experience with the Tahoe Rim Trail, where users must obtain a wilderness Permit for the Desolation Wilderness portion of the TRT, has resulted in the smart solution of allowing users to reserve and print out a permit from on-line registration. It is not uncommon for people to start at unregulated trailheads, days away from the Desolations, so flexibility was factored into the permit. To require the Skyline permit users to only start at specific wilderness trailheads is much too limiting in its regulation. I also question the quota of two people a day to be preposterous. Instead, this permit should allow entry at any trailhead on the PCT, within 100 miles (or other reasonable, justifiable distance) on either side of these wildernesses. Additionally, the quota limit should be raised to a more realistic level until such time only two people a day can be backed up with solid use data, something I doubt can be statistically justified. Lastly, this fee structure is slowly creeping its way into our permit system. This should not be a substitute for a lack of federal funding from our government. With global climate change, increased amounts needed to fight forest fires take away from funds previously used to support our wilderness. With that in mind, please be conservative in what you charge for these rights to access our public lands. Quota are one thing, freezing people out due to costs is another. As we backcountry hikers rightfully take a critical eye to this plan, maybe it’s also an opportunity to see the discussion through the eyes of us backcountry cyclists as well. In situations like this, might it be beneficial to the outdoor community and to the PCT to enlist, rather than alienate, backcountry cyclists as we seek better policies and solutions for managing our public lands?